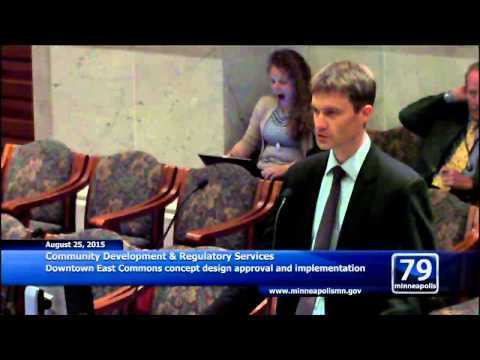 Here’s the you tube recording of community development’s commons park presentation. See agenda below. Move the bar at the bottom of the screen to about the 16 min. mark. Sometimes it takes several seconds for that bar to appear. a. Approving the concept design for the Commons. b. Authorizing Green Minneapolis to undertake a fundraising campaign to support the design, construction and operation of the Commons. c. Authorizing agreement(s) with Green Minneapolis and Ryan Companies for construction of an initial phase of enhancements to the Commons consistent with the Concept Design. d. Authorizing amendments to the existing loan and disbursement agreements for the Commons project. This entry was posted in Miscellaneous on September 1, 2015 by citoyen1789.